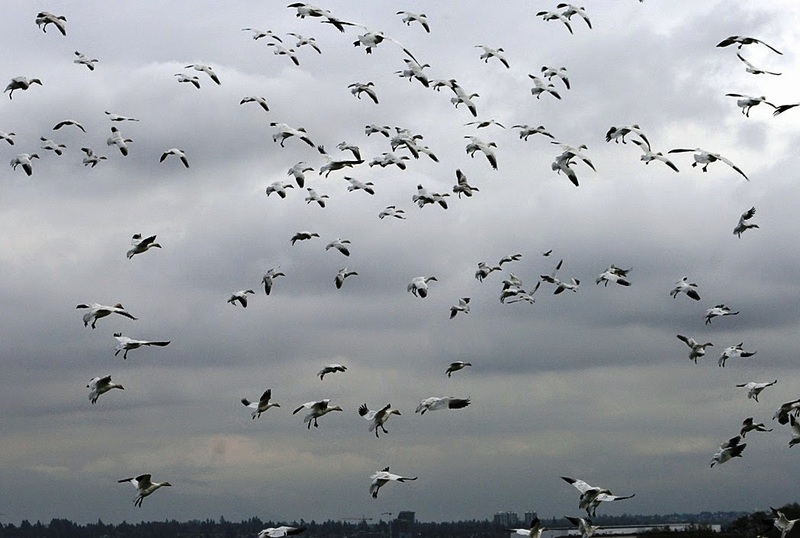 Rock Paper Lizard: Late season honkfest: Snow Geese in Richmond. 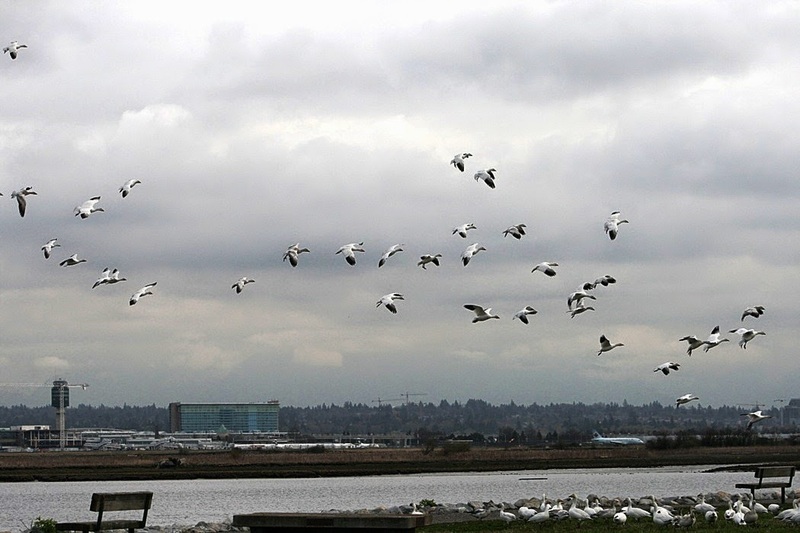 Late season honkfest: Snow Geese in Richmond. They're still here. 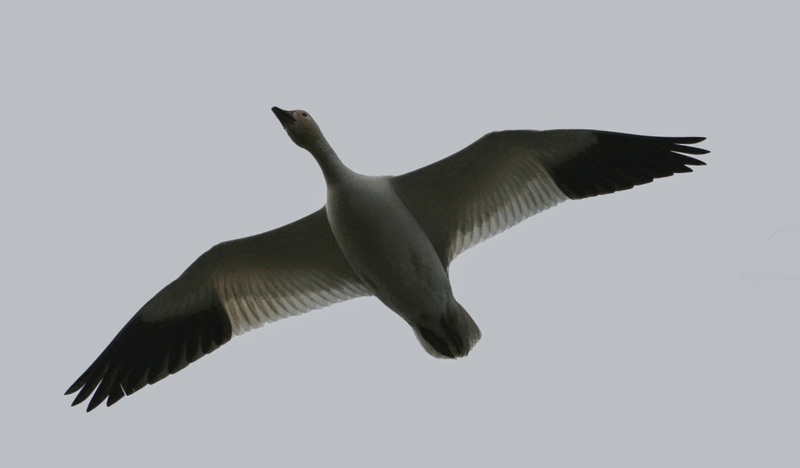 It's nearing the end of Snow Goose season; some hang around into May, but most should be Siberia-bound soon. 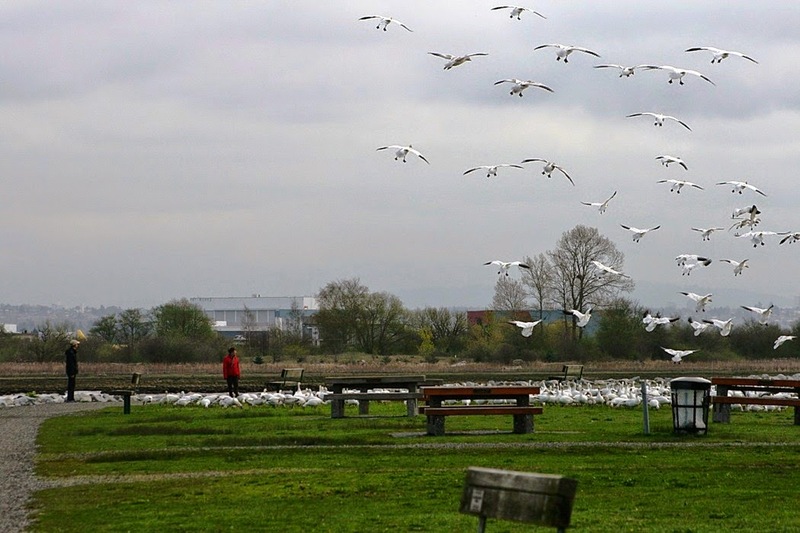 There was a large flock Friday across the south arm of the Fraser from Vancouver International Airport. It started with about a hundred. And then another hundred, and another, and then more, much like planes arriving at regular, noisy intervals. Within 20 minutes there were a few thousand. I don't know how many there were. Lots. Today I took all our empty cans and bottles to the recycling depot. There is a woman who works there who can scan a flat of randomly placed cans and count them in about 2 seconds. 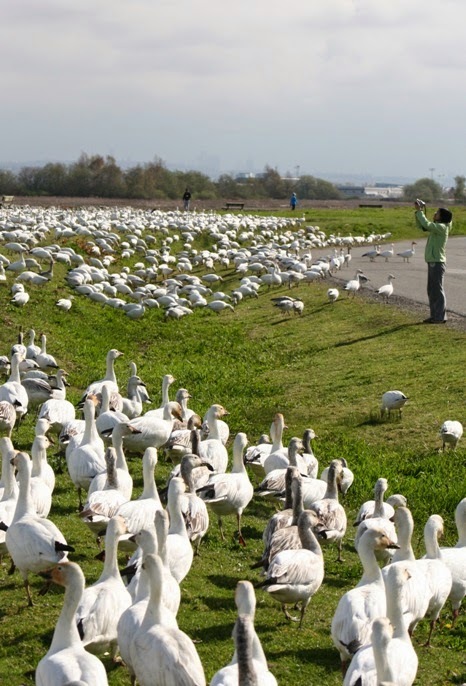 She would probably be good at Snow Geese. 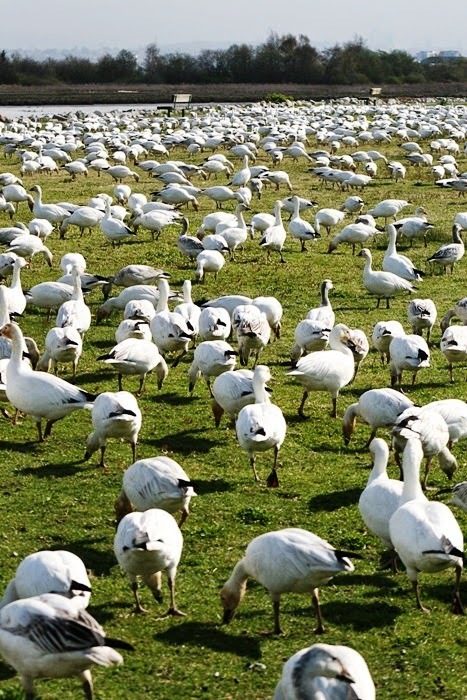 Snow Geese: 4,657 (or so). 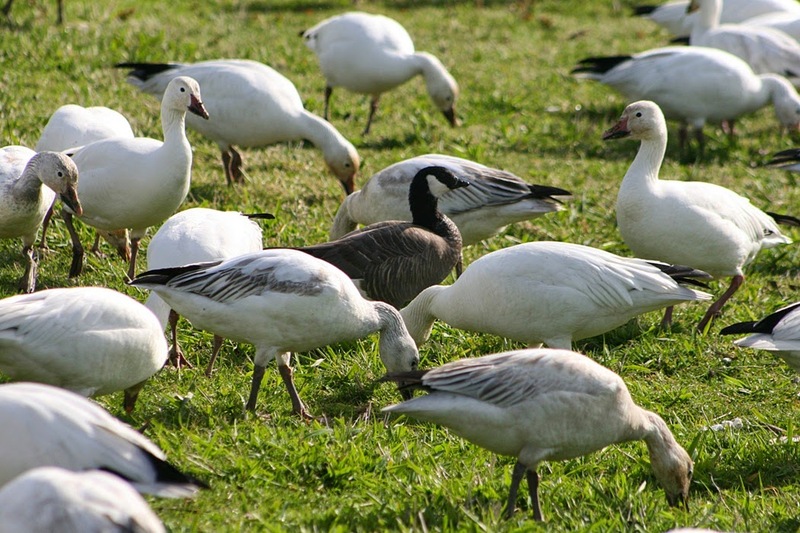 Cackling Geese: 1. I've never seen other geese mingle with Snowies before. Look at those wings. Darn near perfection. I just LOVE seeing them whether floating, strolling, or flying. Their color & shape minimalism x 10,000 birds makes for amazing images. bb: Ross's migrate through the middle of the continent, not along the Pacific Flyway. So as a rule, they don't show up here. As I understand it, the ones that winter in CA fly east over the mountains and then up the plains.